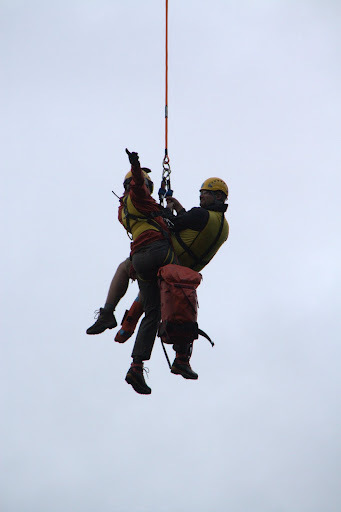 What follows is a first person account of a recent rescue on Eagle Ridge. At approximately 16:30 I get paged: “All members call task line for injured hiker at Buntzen Lake“. 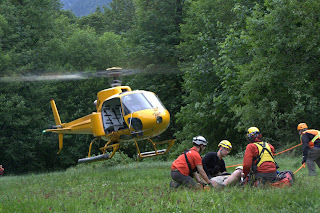 I dial in and hear the SAR manager describing the situation on our voice mail: “BC Ambulance has requested our assistance in rescuing a hiker with a suspected broken ankle on the Halvor Lunden trail above the Polytrichum lookout. All members meet at the Buntzen Lake Warden’s office. Leave your availability after the beep”. I leave my message; I am available for this task, ETA 1 hour and 20 minutes. Unfortunately I am in Downtown Vancouver, and driving to Buntzen Lake is going to take me a long time. Also, unlike most days I do not have a change of clothes with me, and I will need to stop by my house. No worries, it’s near the end of the day, and I’ve completed most of my tasks. I leave work. I’ve become pretty good at estimating drive times over the years. After stopping by the house I turn on my radio and listen on the repeater channel. Radio traffic consists of managers notifying the team where they are and what equipment to pick up, and team members radioing in their ETAs to the command site. Since we do searches out of Buntzen Lake regularly, we use the Warden’s office as command. Today’s rescue is taking place on a bluebird day, so the managers have already requested a helicopter. Several members live quite close to the lake, and they are on scene already. I’m not certain, but from the radio traffic I believe I hear one team heading up in the chopper before the command truck arrives. By the time I make it to the lake, the first team has hover exited at a site we know as the “El Paso” hover exit area. We’ve used it several time in the past; it’s the end of an old logging road that puts you about 50-60 meters from the trail. General rescue site; subject was near the center of the image. Hover exit near end of logging road. Very quickly the team finds the subject, and ascertains that his ankle is either broken, or dislocated and he is not going to be bearing any weight on it. The options are to carry him out, or use a helicopter to fly him out. At the base, the SAR managers decide to send myself and a team in to survey the situation from the air to see if helicopter rescue is possible, while at the same time sending our eight-wheel-drive Argo ATV up the old logging roads as a backup plan. Our flight over the area shows heavy bush, as can be seen from the satellite map above. The guys on scene indicate that the subject weighs upward of 250 pounds, and that a carry is going to be difficult in the terrain between where they are and where the helicopter can land. Consulting the pilot, Derek, I learn that where he dropped the first team using hover exit was not the best for a hover stretcher load (a technique where the rescuers hand the stretcher up to the hovering helicopter, which we have used in the past). We spot one member of the team who found the subject; he has made his way through the bush and found a small clearing. Not large enough to land, but large enough to use a long line. 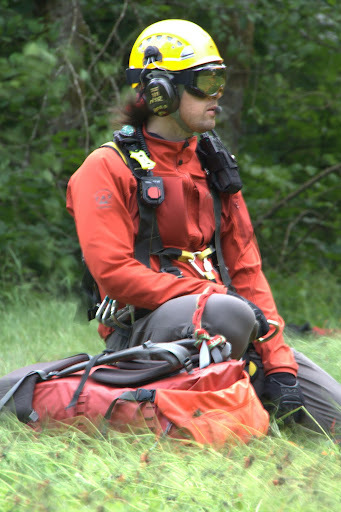 Long line rescue is when a SAR member, attached to a a helicopter by 100 to 150′ line, is lowered through the tree canopy to do a rescue. I happen to be trained to do use this technique. I drop off the rest of my team members at the heli spot we know as “East View” which is to the south of the subject, and the pilot and I fly to Bone Creek in North Vancouver to pick up members of North Shore Rescue and their HETS (Helicopter External Transport System, the official Transport Canada name for this type of rescue). Coquitlam SAR does not have our own kit, and only myself and one other members have the training to do this rescue, so North Shore Rescue, who we work with quite often, graciously helps us whenever these situations arise. Tim Jones, Ales Ponec, Derek Rindau the pilot, and myself fly back to Buntzen Lake to do our recce flight. We re-locate the scene, and throw some trail tape into the trees to mark it for the rescue flight. We identify objective hazards, of which there are few on in this area. We fly back to the Buntzen LZ to rig the helicopter for the rescue. Doors off, harnesses on, radio, helmet, goggles, ropes, biners, and the helicopter is rigged. 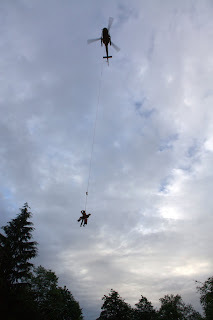 Mission breifing, gear check, and the helicopter spins up. Blades spinning, the pilot does a radio check, and lifts off. A few seconds later, so do I. 2 hours from when the page came in I’ve gone from desk jockey to hanging under a helicopter doing 60 knots over Buntzen Lake. A minute and a half later, I arrive at the rescue scene. Using hand signals I direct the pilot to lower me and I drift slowly down through the canopy. Arriving on scene, I get a quick update from my rescue leader Bill Papove. I brief the subject on what’s going to happen as we get his harness (affectionately known as a “screamer suit”), helmet and goggles on. Make sure his jacket is done up tight. A minute later I signal Derek to bring the line back in, and we hook up. As we lift off I can see the back-up team has arrived at the East View lookout, there in case HETS was not possible. SAR is all about back-up, and I’ve been the backup team many times. Three minutes of high wind, great views, and feet dangling over green trees and blue water, and we’re back at the LZ, ready to touch down. The helicopter lowers me slowly. Ground crew approach to stop my spinning, and my feet touch ground. Because the subject cannot stand we grab under the harness and lower him to a seated position. I unhook the line from myself and the subject, and signal to the pilot that we are free. 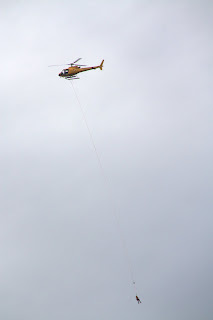 The helicopter lands nearby, with ground crew reeling in the line to make sure it’s clear of the blades. Subject on the ground, helicopter landing. The guy on the right is managing the rope. A few minutes later, our subject is with BC Ambulance. 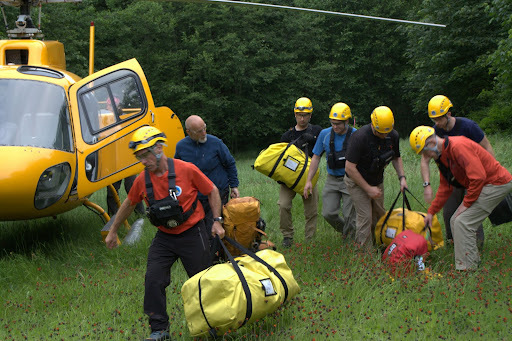 Our support team of 6: the initial team and the three other members are hiking the trail down from the rescue site. They are bringing the subject’s pack, his companion and a dog. A third team is making their way down the mountain on the Argo. Although the rescue is over, the teams continue working; re-packing the kits, de-rigging the helicopter, taking down command, etc. The task finishes when all team members are in fro the field, and the gear is all packed, and back at the SAR hall ready for the next rescue. Approximately 16:30 to 19:00 or 3.5 hours. It is estimated to carrying the subject down the Halvor Lunden trail would have taken 6 hours, and upwards of 12 team members, making the rescue last until midnight. Carrying the subject across the rough terrain to the logging road may have taken 1.5 hours, and an additional 2 hours driving slowly down the logging roads. Using HETS we got him out in 45 minutes, and reduced the number of searchers and resources needed, including the risk of injury to team members.